Statement of Profit & Loss (P&L), as the name suggests, gives the summary of incomes and expenses arising during a particular financial year for a business. When the net income (i.e. income minus expenditure) is positive the company is in Profit and when the net income is negative the company is said to have incurred a Loss. This is a test post from mobile so as to assess the compatibility of the mobile app towards posting new articles in business-fundas.com. interestingly this new approaches very exciting and helps to create post really fast on the fly thank you wordpress for such a great app and a great interface to connect with your mobile and create posts on the go. What Makes Stainless Steel Nails Unique? If you take a minute to look around you, wherever you are, it is likely that you will be able to spot some stainless steel nails. These are now so common in our daily lives that we actually don’t even notice them anymore. However, if you were to imagine a world without these nails, you would probably be horrified. Sometimes, therefore, we should stop for a minute and consider just how important these boring little tools actually are. Continue reading “What Makes Stainless Steel Nails Unique? Outsourcing in current times is more value adding exercise done to enhance competitive advantage by focusing on the areas of core competency rather than just a cost saving practice, as it used to be. Its role as a business-value-creator is established across the world in terms of long-term gains like increased customer satisfaction and decreased customer churn along with short term cost cutting. Along with changes in outsourcing objectives and practices, the pricing models also keep changing in the outsourcing industry. A transaction based pricing model is based totally on the number of transactions. It draws theory from the concept of economics of scale from resource sharing and usage based pricing. In this pricing model the client typically pays the service provider for individual transactions or per unit of work performed by the resources deployed. In such a model, SMEs benefit drastically from resource sharing with overall lower cost of outsourcing. An average base level of transaction is defined in the SOW, the fluctuation from which impacts the per-transaction base level pricing, in this model. Similarly, an FTE based pricing model is one where the client pays for the time & material invested directly by the service provider. Often in outsourcing contracts, this is further broken down into multiple categories dependent on the expertise of the resources deployed, complexity of tasks performed (which impacts turn-around time of task completion), degree of domain experience and onshore/offshore presence. Typically these are fully loaded costs with often standardized SOWs including factors like number and level of resources deployed; infrastructure and external dependencies bundled into the price points. While another variation of pricing models that can under serious contemplation is the Risk/Reward sharing pricing models, where the benefits and the losses of the services outsourced are shared amongst the partners. This is a move towards greater collaboration between separate partners in a value chain. However, for such a pricing model to be really successful there has to be significant maturity in the process level which can then be mapped to quantifiable benefits. As of now, since the services rendered by BPOs/KPOs are yet to reach the required level of maturity, these pricing models are yet to be adopted as industry standards. Next comes the big question: When to choose which pricing model? Typically transaction-based pricing models would be more suitable for Small or Medium sized organizations where transaction count would not be significantly high. In such organization, keeping a dedicated division (with active resources) would be more cost-intensive than sourcing it to third party service providers. Thus in such scenarios, a transaction based costing would be more beneficial. Similarly, if the transaction volume is on the higher side, a FTE based pricing model (and outsourcing SOW) would be more cost effective and thus more suitable for the organization. Also, if the transaction levels are subject to high degree of fluctuation, a transaction based model (and thus the SOW) is more suitable and beneficial for both the parties involved in the deal. Do let us know if you have any feedback in this context. Typically services are characterized by the 7 Ps of services marketing namely Product, Price, Place, Promotion, People, Process and Physical evidence. One of the crucial success factors for a service to gather acceptance amongst its target market is that of a proper mapping of one of the crucial dimensions of the 7 Ps, namely the Process. Process mapping in services marketing is simply a sequential workflow diagram to display a clearer understanding of a series of sequential processes or series of parallel processes that takes place while a service gets delivered to the customer. Processes are important to deliver consistency in quality in a service. Services being intangible, processes become all the more crucial to ensure standards are met with. Relative to a services marketing strategy, mapping of service processes ensures that a quantifiable way is used to determine where and in what amount current resources are being allocated. Once a service delivery manager knows exactly how the current resources are being used, he can optimally allocate resources in the future. It also helps to uncover inefficiencies and non-value added activities. Service process mapping also helps move services process from a reactive to a proactive mode. Bottlenecks in service delivery may be identified and the exercise helps to ensure that quantifiable structured improvement in the service delivery may be achieved by the service provider. The above framework gives a step my step description of how services should be mapped to ensure consistency in service quality delivery, which plays a key role in fulfilling customer expectations and thus ensure customer satisfaction. Focuses the workforce on the customer’s perspective of the service process. Ensures more reliable and consistent service delivery processes across all units. Improves the start-to-finish project time. Serves as an excellent training aid for new employees. Uncovers inefficiencies and non-value added activities. Identifies obstacles and bottlenecks that are hampering the service delivery. Provides management with the scope to make structured improvements. I hope the details provided in this article would be sufficient to chalk out a mapping for the processes of a service, prior to delivery. Do let us know if you have any query. Digital Marketing is basically promotion of brands using all forms of digital advertising mediums to reach the target segment. This now includes Radio, mobile, Internet, Television, social media marketing and other less popular forms of digital media. While the talk of the day is internet marketing, the latter is only a subset of digital marketing. While digital marketing does involve many of the strategies involved in Internet Marketing, it extends beyond this by including other channels with which to reach people that do not require the use of the Internet. As a result of this decreased reliance on the web based media, the field of digital marketing expands to include media such as cellular media(sms/mms/phone calls), digital signage (digital banner ads and digital outdoor signboards), and other media like television and radio, it is thus a much more comprehensive methodology to reach out and engage your target audience, and with a higher conversion rate for most product categories. Previously seen as a stand-alone marketing strategy because of its extension on mediums which it covers, it is currently visualized more as a marketing effort that covers most, if not all, of the more traditional marketing areas such as direct marketing by providing the same method of communicating with an audience but in a manner using the development of science and technology and thus optimizing resources. The spectrum of digital marketing is now being expanded to support the “servicing” and “engagement” of customers, and thus cover not only customer acquisition but also customer retention. So how should firms go about planning their marketing strategies for a successful digital marketing program? While there is no such common strategy which fits the requirement of all firms like a glove, there are few generic strategic and economic issues that firms need to keep in mind while designing their marketing program. The first grid has three elements of your proposed strategy. Does your strategy match with the vision and mission of your firm? Does the strategy assembling platform match with the knowledge that is within your marketing team? Is that knowledge formally managed using any platform? Then comes the question of how you are delivering the value transfer from the production of value, to the assembly of value to the end value consumption in a value chain. Is your firm geared to take charge of such a business model? As in the second half of the architecture, the business model dimensions need to be evaluated based on the digital marketing capabilities. Most important dimension for serious consideration is whether your organization structure is geared to handle the marketing methodologies you are planning to implement. The dynamics of knowledge distribution also needs to be looked into based on this framework. 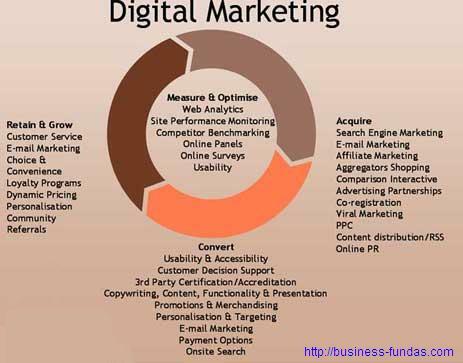 Hope this helps your company to chalk out a successful digital marketing program. Do let us know what you think of the article, with your valuable comments. Have you read our article on the 4 P’s on Social Marketing? Also did you read our article on the The 4 P’s of Marketing – The Marketing Mix strategies? These articles are highly popular posts in our educative blog. How to build a Successful Business Model or a Business Plan? Business Models are crucial for the success of an enterprise or even a startup. So what do you need to focus on while building up your business from scratch? A Business model or a Business Plan (B-Plan) helps you to plan this properly. What are the firm’s core capabilities? How does the firm deliver value to its clients? How does the network with its partners/collaborators (value chain) add to its core competencies. How does the value chain model collaborate with the firms current strategies? What is the cost structure in the business vis-a-vis that of the firm? How is the value proposition unique and sustainable in the long run? How does the firm manage its distribution channels and relationships / liasons with the customers? How is the targeted customer contacted, acquired and retained? What are the sources of revenue and the structure of the same? How does the vision/mission statement adhere with what the firm is doing now and what it is planning to do in the future.